People are adding different smart devices to their homes like smart cameras, smart thermostats, smart home hubs and other gadgets. And I always advise to get smart doorbell first to secure your home and always know who is at your door. I tested many standard wireless doorbells and different video and smart doorbells, and now it’s time to compare the top ones from the list. Here you find out how the new August Doorbell vs Ring Pro vs Skybell HD compared to each other in multiple tests. Let’s first talk about different types of video doorbells. Doorbell camera system options are a hit today. A simple push of a button can just give you all the information you need about the visitor at your door. So what makes wireless video doorbells such a neat concept. Well, now you have wireless technology that is constantly updated to make home security systems more efficient. This wireless video-door-phone intercom system of home automation uses no wires and a good WiFi connection to give you all the access to your home locks even when you are away. Check out some of our video doorbell intercoms reviews to know more about this. Video intercom systems are easy to install, come with kits that solve the trouble for you and are some of the coolest items on the market today. We bring you some of the most informative wireless video doorbell reviews to understand the need of the technology in your home. Two-way Communication – These door video camera options are wireless video intercom doorbells that allow you to speak to the visitor as you answer the ring. You can use them from anywhere in the world on your phone by using techniques like MyQ technology. There are also options that come with video door phone intercom system with two monitors. This is one of the most popular categories of doorbells when you want something that is suitable while you travel. So, you have doorbell with camera and intercom. Night Vision – Not only does this doorbell video come with an impeccable doorbell security camera, but there are also some that come with a perfect night vision feature. This allows you to see a person as clearly in low light too. So when you use your video doorbell intercom, you can see who is at the door even in low light. This is a feature that most people choose if they are working at night or want proper supervision in low light too. Wireless door bell system with light indicator – You will also spot some video intercom doorbell options that come with indicators. Every time you have a visitor, there is a notification on your phone. This takes a few seconds, and the notification light also turns on if there is any movement around the door, even if the guest does not ring the bell. When you choose from the video doorbells, you will find that many users prefer this feature over any other video intercom system. Installation – The wireless video intercom system options are now coming with easy DIY system that does not require you to do anything when it’s about installing it. They can be mounted easily and are easy to install. In some cases, there are video doorbells that come with the complete package that allows you to simply plug in the Bell and the rest is taken care of. Touch Screen – Among the slew of great options in video doorbells are some that come with touch mechanics. Using these is a breeze. So you are not struggling to push a button at all times to answer, but these are more elegant looking models that blend well with the interiors too. These come with wireless video intercom options that are among the long range of door bells. The doorbell wireless buttons are quite smooth. First, let’s take a look at the table below of wireless video doorbells we reviewed on our website. Home automation gadgets tend to have a modern, sleek look, and all 4 doorbells look like technology from the future. Ring doorbell was the first wireless video doorbell on the market and have a bulky, but still stylish design. It’s little bulky compared with other doorbells, but it’s a great job. Ring pro model has a smaller design with 4 different interchangeable color panels. You can match doorbell color to your house or front door color. Also good to mention that it does remind me like a real doorbell and looks more familiar. Skybell HD doorbell has similar round silver metallic design like previous generation Skybell and Skybell v2. August doorbell looks more solid and feels heavier which makes it looks more expensive and cool. You can choose between couple colors to order. I got the metallic color to match with other doorbells. I love the design of August doorbell, but if you can’t get matching color to match your house, then the 2nd choice will be Ring Pro video doorbell. Dimensions 4.98" x 2.43" x .87" 4.50" x 1.85" x .8" 2.9" x 2.9" x .9" 2.8" x 2.8" x .9"
Wireless video doorbells are the new piece of technology for the smart home, and it should be easy to install without cutting wires. I prefer plug and play gadgets so even my grandma will be able to figure out how to install it. To fully function all doorbells require the external power source like existed mechanical or electrical doorbell or transformer. Except for Ring doorbell also has a battery which can last up to 1 year before need to recharge it. Ring doorbell can be hooked up with existed doorbell wires or with external power source 16-24VAC. If you don’t have any existed doorbell then you in luck and can just charge it with micro USB cable and attach to the wall. Ring Pro includes advanced power kit which you will need to use to hook up with either existed doorbell wires or external 16-24VAC transformer. Power kit will help to stabilize power from the source and make sure doorbell will get the exact power that it needs. Skybell HD also needs to be connected to either to existed doorbell or external power source. But to if you would like to power with external source then you will need diode/resistor for it which sold separately. August doorbell don’t need any diodes or resistors and like other ones you can either connect the device to existed doorbell wires or external 16-24VAC power source. All doorbells come with the screws, screwdriver and other accessories necessary to attach it in front of your door. After you powered up doorbell, you will need to download an app for your iOS/Android device and follow steps to setup. I setup everything on one box then connected 3 doorbells with 3 external AC power adapters and Ring doorbell working just on battery. You can see image below how they look in action. Ring doorbell has a 720p wifi doorbell camera system which is not full HD, but good enough to see who is nearby your door. But by surprise has great viewing angles and high brightness. Ring Pro delivers superior 1080p video quality comparing to Ring doorbell, but has smaller viewing angles and video also darker than non-pro version. August Doorbell Cam has a decent camera which delivers 960p video quality. The view angles are the worst from all four cameras. All doorbells support zoom in/out function in video view. From all of doorbell camera reviews I can say Skybell HD is clearly the winner in this test. Almost all of video doorbells support live view except Ring doorbell. Of course, the live stream isn’t perfect, and each doorbell has some issues. In our test, we found Skybell HD has the fastest live stream with minimal delay. The 2nd place is Ring Pro which has around 0.5 – 1-second video delay and last place August doorbell which has the slowest live stream about 2 seconds delay. Motion detecting feature will notify you of people or animals nearby your door and also record video. Skybell HD comes with motion detecting feature, and you can enable it and setup sensitivity which approximately will trigger 5 – 10 feet from the doorbell. Ring and Ring Pro comes with advanced motion detecting feature where you can setup which areas to track. Ring Pro has a superior interface where you can setup with wireframe multiples location to track. Where Ring doorbell you can only setup which location to track and how far away. See screenshot below. August doorbell comes with metal detector sensor, but unfortunately, the app currently doesn’t support. But they are working on it and will unlock this feature in the future updates. Another test I did is, of course, to run video at night and check how clearly we can see what’s going on outside. August Doorbell Cam doesn’t have any light or infrared night vision LED, and it performs poorly at night. If there is no lighting available around then, you won’t see anything. It will work great if you combine with external light which will trigger when doorbell button pressed. Ring Doorbell has LED ring around the button light up at night when in use. It does help to see what’s going on outside and who is by your door. Ring Doorbell Pro has infrared LED vision. You won’t see everything in colors, but the picture is clearer comparing to Ring doorbell. Skybell HD has clear, colorful picture at night and this because it has the very bright led light on the top of the doorbell and another one around the push button which help to deliver very clear video at night. As you can see Skybell HD deliver better image just because of powerful LED light coming from it, but it’s super bright and in my opinion to bright for the eyes of your guests. Otherwise Ring Pro will work great without any light and no eyes irritation. The audio quality of smart doorbell is worth to consider when you are choosing between top smart doorbells models and here what I found. I found the interesting thing where audio only delays from doorbell to the cell phone. But from cell phone to doorbells there are almost to no audio delay. August doorbell has the biggest delay among all of the doorbells that we tested. The sound delay is about 1-2 seconds apart which is crucial when you are communicating with someone in front of your door. But the sound quality is good overall. Skybell HD has a sound delay in about 1 second which makes is the 2nd choice, but overall sound quality is great. Ring & Ring Pro doorbells are leaders in sound response and sound quality. Sound delay almost doesn’t exist, and we were happy with the audio quality as well. Overall all doorbells have sound quality almost the same, and I was able to hear clear on both ends. Each company developed apps for Android and iOS where you can control your smart doorbell and get a quick notification when someone presses doorbell button. HD version of the doorbell got the new dedicated app for it and offers plenty of different features. Wath live stream and talk. Take a picture of the current video view. Watch previously recorded videos for last seven days. Integrate with Nest, IFTTT, and Kevo. You can change LED color which super cool I think. Turn on/off motion detection and sensitivity. Turn on/off the indoor chime. Change image quality with 4 options: 480p, 720p (good), 720p (better) and 1080p. For reducing data usage. Specify the different type of notification to push when: button pressed, motion detected and if device went offline. I had some issues with the app and connecting to iOS and Android at the same time. Sometimes it gives me an error that doorbells already in use or unable to connect. It has all kind of features implemented in one place. You can add multiple Ring and Ring Pro doorbells and manage from one app. And also specify an address where exactly doorbell located. You can add and integrate with different partners like ADT Pulse, Wemo, Lockstate, Kevo, Wink, Kisi, and Lockitron. You can see all history and view: Rings, Motion detections, and Live Views. Ring doorbells come with 30 days trial for cloud storage and then you can setup payment service to store, view all videos for last 6 month. You can setup for each doorbell Ring Alerts and Motion Alerts. Link indoor chimes which you can buy from them. Ring Pro has live view feature and Ring doesn’t. Ring Pro has better motion detector interface and setup. You can see battery live of Ring doorbell, and you will know when it’s time to re-charge it. You can control August doorbell and August smart lock within their app, and it’s perfect when you have both smart gadgets for your house. The only thing I didn’t like that for iOS app only made for iPhones and not for iPad which is no big deal just graphic looks little off. But I think developers are working on the iPad only app and will release it soon. You can setup and control Doorbell Cam and Smart Lock within the app for multiple houses. You can give smart lock access to your friends and family. Integrate with Nest Cam outdoor or indoor and with Nest Thermostat, Harmony System, Xfinity Home system and Airbnb. I guess it’s perfect if you have Airbnb property for rent. You can watch a live stream and talk with people through the app. You can see all activity and history. Ability to check battery charge and Wi-Fi signal. Turn on/off doorbell cam chime. Notify when the doorbell went offline. I didn’t see any delay in response time. All doorbells work great with iOS and Android device. If you would like to store and view videos from doorbells, then you will need to have cloud storage. Ring offers 30 days trial and then it’s $3/month if you would like to store videos for 6 months. If you only need 7 days of storage, then Skybell offers it for free. There are also ways to set up home DVR system to store all videos for free in house network. Skybell works with Nest products which can show a warning and trigger a smoke alarm from Nest Protect’s smoke alarm. Turn on Nest Camera automatically when Skybell triggers motion detector. It also works with Kevo smart lock, and you can open your door lock when you are using Skybell app. And if you like to play with IFTTT the Skybell supports it, and you can configure different types of situation and combine other smart home devices together. Ring can be integrated with variety home automation gadgets. You can connect to smart locks and after you can operate with your door locks through the live video feed. Or you can connect doorbell app to Wemo and Wink systems to turn off/on power outlets and light switches. August Doorbell works mainly with August smart lock and also support other products from Nest, Harmony, and Xfinity home system. You can setup nest cameras and view them directly from the August app and also check the current home temperature. Best Compatibility Doorbell: Skybell HD because it supports IFTTT. if you are looking for top quality and easy to use and you best video doorbell then I will tell you my choice below. Also, I am planning to make video comparison which I will post soon and I am planning to include some other smart doorbells. If you have any request, suggestion what would you like to see in the video or which doorbell you would like to compare please leave the comment. It’s hard to decide which smart doorbell to choose, and right now I am considering Ring Pro vs Skybell HD. Ring Pro has better audio quality, motion detecting is the best among other doorbells and also the app which never let me down. Video quality is great, but not the best. It does work with a lot of different smart home gadget but doesn’t support IFTTT yet. Skybell HD delivers the best colorful videos in day and night time, and it works with IFTTT. Also worth to consider it because it does come with seven days free cloud storage for the videos. The audio is a little bit slow and the motion detector isn’t configurable like Ring Pro and a big minus for me was the issue with the app sometimes. Which one will I choose between them? I will go with Ring Pro doorbell because I like how it looks and video quality is enough for me and has perfect audio quality without delays. If you are on the budget and trying to save some money, then the best smart doorbell for the money will be Ring Video Doorbell. It has good video and audio quality with fast app response. It also shares the same app as Ring Pro. The only major differences between Ring Pro vs Ring doorbell is video quality and motion detecting functions. Another reason why I like Ring doorbell it because you can just charge it once a year and don’t need to cut any wires in the house and just charge it and attach it to the house wall the front door. Why didn’t I choose Skybell HD? Because it’s more expensive and the only significant differences between Ring vs Skybell l is video quality, but the price tag is bigger. It all comes which functionality you need or like the most of the doorbell and how much money you would like to spend. If you are ok with the video quality of Ring doorbell and don’t need advanced motion detecting system, then it will do all the job for you. And you don’t need to cut any wires because it does have a built-in rechargeable battery. If you are looking for better video quality and motion detecting, then you can pick up Ring Pro doorbell. Need cloud storage, but you don’t want to pay for it then your best bet will be Skybell HD. And the August doorbell cam has the best design and will be great choose for people who already own will get the smart lock from them. There are many other doorbells on the market which people interested to compare. Many readers asked me to review first generations of Skybell, Vivint doorbell camera, Doorbird vs Ring, Zmodo vs Ring and even to compare hidden doorbell Kuna vs Ring doorbell. I didn’t include to compare 1st and 2nd generation of Skybell vs Ring doorbell in this review because I didn’t have currently and the quality wasn’t there in this model to compete. Also, I decided didn’t include Zmodo doorbell since reviews aren’t good online, but I will plan to add it in the future. I am interested in getting my hand on Kuna doorbell since it’s hidden and it also comes with external lighting. 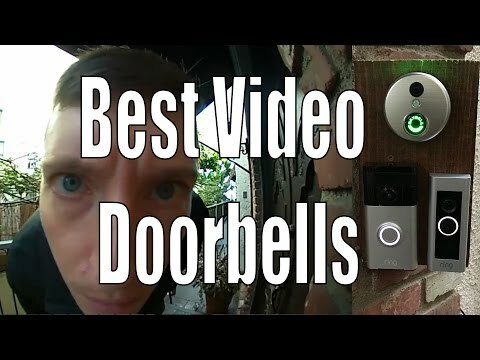 Thank you for reading my comparison of top rated video doorbells. I hope you decided which doorbell to get after reading this smart doorbell reviews. Please leave a comment which doorbell you bought or would like to buy and why and also let me know if you have any questions. Great review. I just installed a Skybell HD and I’m concerned with the motion detection. I still need to add the wedge to point the cam more central to the door. I’m wondering if this will make the motion detection more reliable. Is the Ring Pro’s motion detection really that much better than Skybell hd? Great analysis, very helpful Thanks! You swapped the SkyBell HD and August installation pictures. Can you comment on the accuracy and the reaction time of the motion sensors? I heard that the SkyBell HD reacts only after at least 10 seconds and often people are notified but the clips show nothing. I also heard that the Ring tends to have false positives so what you set in the nice app is not really what you get in real life. Suppose you could report on how fast the video clips start for each of the models that offer that feature? Do any of them gave the capability to connect to two iPhones at the same time? When we are watching movies in the basement sometimes only one of us has our phone with us. Currently we use a two way audio baby monitor. You can also use multiple phones with the standard Ring doorbell. I just installed mine today and my wife has access on her cell phone as well. Skybell HD is more affordable because it does not have a monthly or annual fee. RING does. This is one reason why I’m wanting a skybell HD instead. If ring made a. Round doorbell and had no fees it would be something to consider. Is it possible if you have a smart tv that allows Internet, should be able to load through the router with your wireless device (if it’s in sinc on you on your wireless device? Yes please. I haven’t been able to find anything, and this is the biggest deciding factor for me. I have the ring now and thinking about switching to SkyBell because of this. I purchase the doorbell and it works ok, there are better options plus the doorbell needs cloud storage to view anything that happened in the past. Later on I purchased the stick up cam and found out after I bought it, each device needs it’s own separate cloud storage that is purchased separately. Find a better option, there are many out there. Can both the Skybell HD and Ring Pro be setup to work with a DVR? Where might one find some hints how this might be done? Can you save the videos to any cloud service or is it fixed to point to their own cloud? Which Ring device is model number 7G-88RG02FC1 and which is 88RG000FC100? Hi,I have a ring doorbell and it does have live access. I was charging when needed then when I hardwired it the live access showed up in the app. I actually was out and about and whistled for my cat and got him to come to the door because the live view works so well. Have had since sept 2015 and just caught intruder in backyard with the night vision motion detection allowing me to phone police. Thanks for reviews, I had checked many sites reviews before purchasing my doorbell and it did help a lot. What up load speed do you need? I installed a skybell HD on the door nearest to my home office – the office where the wifi router is has the same outside wall that the skybell is installed on. My wifi tests consistently at 12 mips, but the doorbell is always delayed on the phones (iphone, ipad and galaxy s7 edge) – I mean sometimes 3 minutes or not at all. Any idea what might be wrong? Try a hard reset of your smartphone. I had the same issue, and I pressed the home button and power button simultaneously on my iPhone and now the notifications are few milliseconds in delay. I bought the Skybell HD while it was on sale for Cyber Monday. Works great and doesn’t seem to attract too much attention, which is what I was looking for. Great review of products. Do you have any input on longevity of products. I have Sky Bell 2.0. Purchased in July 2015. I have had to replace it three times due to hardware failure. I decided to upgrade to Sky Bell HD and it is shipping today. Have you heard of issues with any other manufactures? Is this normal? Does that chime work with the Pro version? Does the chime work on the first generation cause you can use it on battery ? How shall these be operated by kids when they do not have a mobile phone? For me, Doorbird is the only choice. It can use POE ethernet so I don’t need a battery or flaky wi-fi, has phone app and can be connected to a surveillance system for live streaming or recording to the cost-effective cloud, so I’ not tied to the vendor for a subscription. It’s a bit more money, but I’d rather buy once. I’m looking to buy Ring Home Security Kit with Ring Doorbell Pro, 2 Ring Stick Up Cams, and Ring Chime. Can you tell me if it a good idea? SkyBell released a new version of Firmware a couple weeks ago (Jan 2017), and the motion detection is just about spot-on now. The recording starts as the person comes into view. It works perfect for me now. What are our options if we don’t have the hardwiring for a doorbell in the location we’d like to place a smart doorbell? Help! I’m looking at Ring Pro. If it is hardwired to existing doorbell wiring, will it ring inside using current chimes? Or would I need to also purchase Ring Chimes? Thanks! You were instrumental in helping me make my choice! Thanks for that very helpful review! Please email me the phone number of technical support for the Ring 7877826. Looking for a door viewer for my daughters apartment that is wireless and rechargeable without have to pay for a cloud service. Her apartment building will not allow a peep hole through the fire door and I want her to see who is on the outside or her door.